A black iguana (Ctenosaura similis) is sometimes green, requiring characters other than color to distinguish it from the green iguana (Iguana iguana), such as the rings of enlarged scales in the tail, the presence of a single large, smooth scale beneath the eye, and the absence of an enlarged scale beneath the tympano. 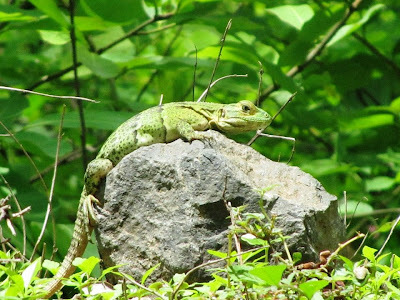 The black iguana is far more common in Laguna de Apoyo Nature Reserve. Photo by Tessa Janga. Laguna de Apoyo Nature Reserve is such a beautiful place precisely because so much nature is still in and surrounding it. We noticed, many years ago, how the forests were teeming with wildlife and a rich diversity in tropical plants, and that the beautiful clear, blue waters of Lake Apoyo depend on the presence of intact forest along the interior slops of this lake. Although many people visit this special place, it can still count as one of the secrets of Nicaragua. Laguna de Apoyo viewed from Catarina. Photo by Sienna Potts. 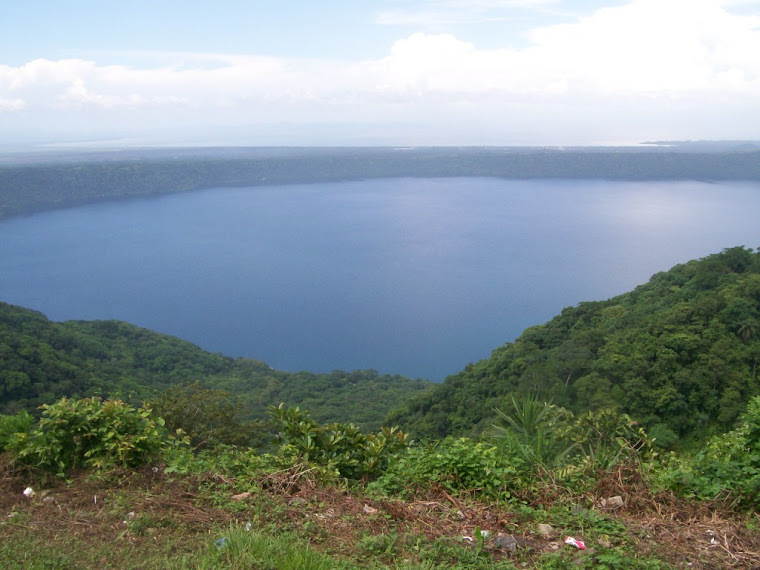 Mankind is the worst enemy of natural areas such as Laguna de Apoyo. Trash dumping, hunting, illegal construction, and deforestation with pesticide use are rampant wherever there are people, and Nicaragua is not different. Just below the Catarina overlook, for instance, a group of "investors" with the blessing of the then-president of Nicaragua built 65 bungalows, a hotel and convention center, all of which add up to a serious ecological disaster, as well as a financial nightmare for the non-Nicaraguans who joined the project as co-investors. But not just like in all countries, many conscious, caring people are found in Nicaragua. 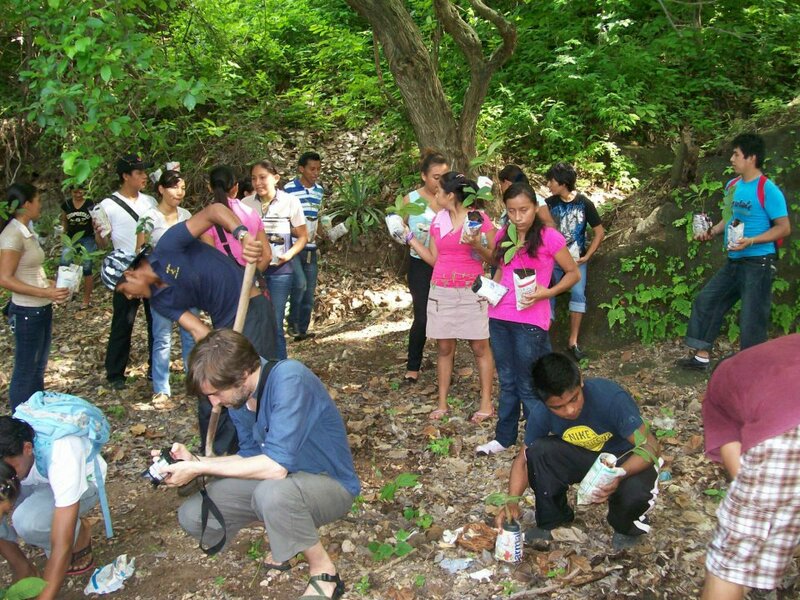 For instance, dozens of members of the local community came to Laguna de Apoyo Nature Reserve to participate in a tree planting activity earlier this year. Thanks to all for volunteering your time! Young people from Masaya and neighboring towns came to plant trees in a reforestation activity in Laguna de Apoyo Nature Reserve. Photo by Frank Lindt. The lake is usually very quiet, especiallly at dawn, with trees along much of its shore attracting birds and other wildlife. Weekends, however, attract visitors from Masaya and other communities, and the lake shore can be festive with families enjoying a day out in nature. The lake stretches four kilometers across and is 180 meters deep, with slightly salty water filled with volcanic minerals. Water clarity varies from five to fifteen meters, making the lake ideal for SCUBA divers to enjoy. Dawn on Lake Apoyo can be serene. Photo by Christine Bruxer. Lake Apoyo is known for its water, but more is going on than may meet the eye. This lake is located inside a volcanic crater which exploded 23,000 years ago, leaving a gaping hole hundreds of meters deep in the earth. Hot spots still abound around and inside the lake, too. SCUBA divers can easily find volcanic vents in the lake, and a few are also found on the lake edge. Many water wells are useless, because the water they produce is hot, salty and corrosive. Most people think of the water in the lake when they think of Laguna de Apoyo Nature Reserve, because it is simply spectacular. Our team of wildlife specialist and volunteers, however, have taken the opportunity to learn many of the secrets of the jungle around the lake, inside the volcanic crater. Over four hundred species of plants are found in this forest, along with dozens of species of mammals, reptiles, and hundreds of birds. This photo makes the first documented gray four-eyed opossum (Philander opossum) in Laguna de Apoyo Nature Reserve. Many secrets of nature await the intrepid observer. Photo by Lucas Betthauser. 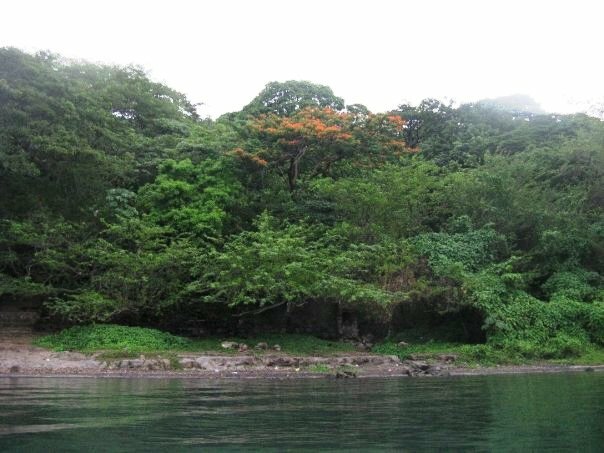 Professional wildlife guides can arrange guided tours of the nature in Laguna de Apoyo Nature Reserve. A typical birdwatching walk of only one hour at dawn, for instance, yields around 25 species. The simple checkerspot, Chlosyne hippodrome, is one of more than two hundred butterfly species one can appreciate in Laguna de Apoyo Nature Reserve. Photo by Helen Croll. Estacion Biologica provides lodging, meals, and services such as birdwatching SCUBA diving, and kayaking the lake. We also provide courses in Spanish and in natural resources management. Our site is operated by FUNDECI/GAIA. Visitors and tourists are always welcome.